Former Terrier standout and NHL head coach Joe Sacco has returned to Boston as an assistant to Bruins head coach Claude Julien. 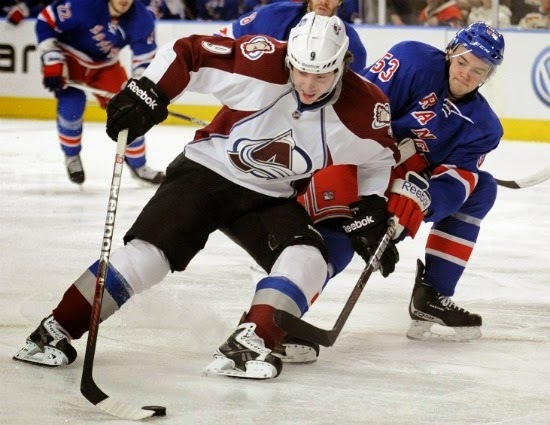 The Medford, Mass., native, who spent 11 seasons as an NHL player and scored 213 career points, was an assistant with the Buffalo Sabres last season following three campaigns at the helm of the Colorado Avalanche. During the 2012-13 season, current BU head coach David Quinn was his top assistant. As a Terrier, Sacco scored 63 goals and 65 assists in three varsity seasons (111 games) and helped BU reach the NCAA Final Four in 1989-90. 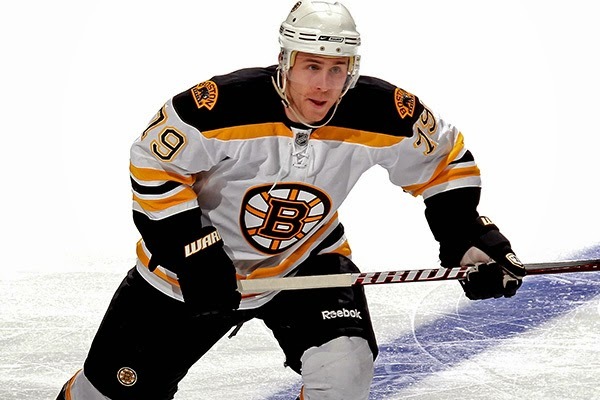 Former Terrier defenseman David Warsofsky has re-upped with the Bruins, signing a two-way contract. Warsofsky, who scored his first NHL goal last season, spent most of the year with AHL Providence. 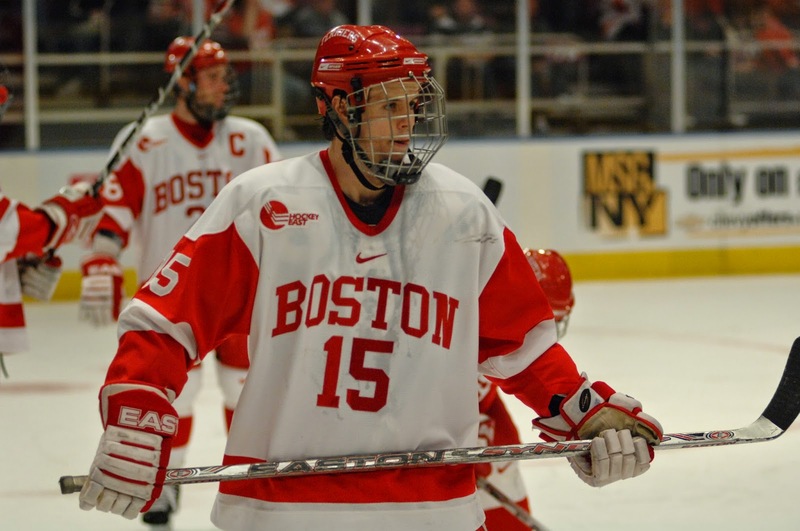 His brief NHL stint made him the sixth defenseman from BU’s 2009 national championship team to reach the NHL. Kieran Millan, who won ACHA National Rookie of the Year honors, along with second team All-Hockey East distinction, on that 2009 NCAA title team and would go on to have his name all over the BU records books, has retired from professional hockey. After spending the past two seasons with the Denver Cutthroats and Lake Erie Monsters, Millan has accepted a position in Calgary with the Hockey Helps the Homeless charity tournament. During a stellar four-year career at BU, he established new marks for wins and saves in a season, as well as career highs in saves and minutes played. Former Terrier MVP Alex Chiasson was introduced to Senators fans at the Sens House Sports Bar and Grill in Ottawa and talked about his recent trade from Dallas and his off-season routine. “It’s great. I love the red,” Chiasson said of his new team colors. The St. Augustin, Quebec, native had a 13-22-35 scoring line in his first full NHL season. 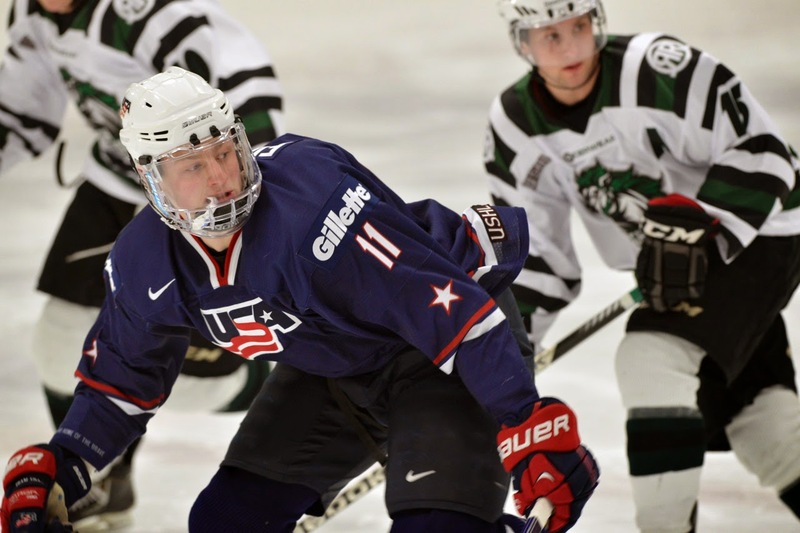 Incoming freshman Jack Eichel and 41 other players begin US Junior National Team evaluation camp in Lake Placid, N.Y., on Saturday, Aug. 2. 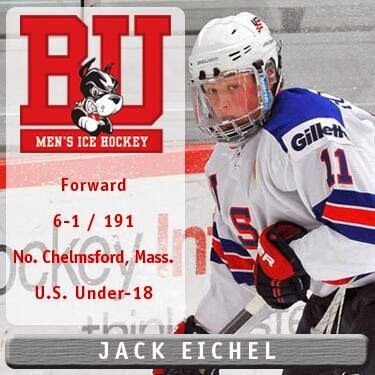 Eichel played for last year's Team USA as an underager, scoring a goal and four assists in five games. Just prior to the 2015 World Junior Championships in Toronto and Montreal, this year's US squad will play exhibition games in Boston, including a Dec. 19 match-up with the Terriers at Walter Brown Arena. Former Terrier captain, NHL player and coach Mike Sullivan is one of the coaches at next week's evaluation camp. 2016 recruit Clayton Keller turns 16 today, while his future coach, David Quinn, celebrates his 48th tomorrow. WEEI’s Scott McLaughlin's in-depth interview with freshman Jack Eichel reveals how the freshman forward's focus on immediate goals and improvement, and a willingness to challenge himself against older players has helped him become one of hockey’s top prospects. Johnathan MacLeod, Eichel’s teammate with the U-17's and U-18's and now at BU, talked with the Lowell Sun about a whirlwind last few months that included winning a gold medal at the World U-18's, being drafted by Tampa Bay in the second round, attending the Lightning’s development camp and beginning classes at BU. ► Four Terriers—sophomore Nick Roberto and freshmen J.J. Piccinich, Conor LaCouvee and Brandon Fortunato— as well as 2015 recruit Charles McAvoy--are competing in the 2014 John Cunniff Senior Chowder Cup tournament, which begins today. Following strong performances at the USA Select 16 Development Camp, 2016 recruits Hank Crone (photo) and Kieffer Bellows were named to the U.S. U-17 Select squad that will play in the 2014 Five Nations Tournament, Aug. 13-17, in Crimmitschau, Germany. Both future BU forwards played in last Sunday’s development camp All-Star game and each scored a goal for Team Blue, a 4-2 winner, with Bellows adding two assists to earn.SBNation’s Jeff Cox’s nod as first star. BU recruit Kieffer Bellows saved his best play for the All-Star Game. 2 goals, strong play along boards, being physical and driving net. 7. 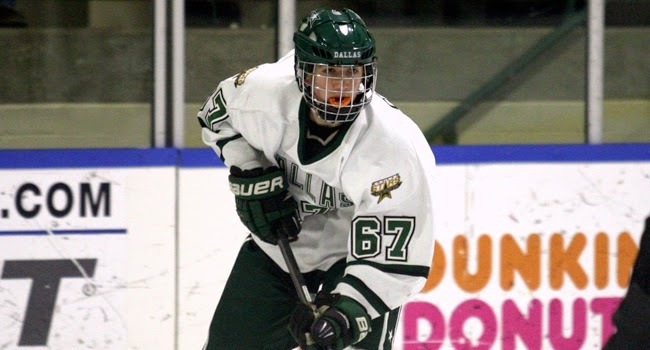 Henry Crone (#18 Royal) 5-8/145 Dallas Stars Elite U16 (Boston University) - Another player whose skill became more apparent as the week went on. He is a great stick handler with good speed, but perhaps most impressive was his ability to read plays and anticipate where his teammates would be and where to find pucks. 10. 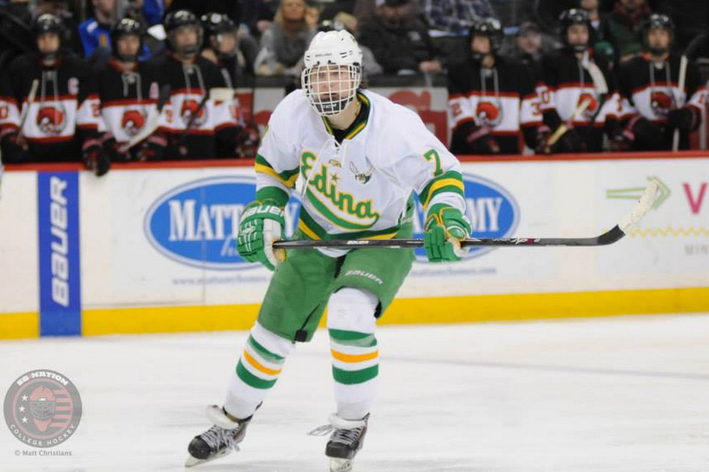 Kieffer Bellows (#11 Red) 6-1/190 Edina High School (Boston University) - This observer didn't think he truly showed what he's made of until the All-Star game. Admittedly, he was playing on one of the weaker teams here during pool play. He's a power forward who likes to throw his weight around. He made several jawing hits during the camp, but then came alive on Sunday. He drove to the net and scored two goals, as he was one of the better players in that game. He's got a quick release and is strong on the puck. He reminded me a little of Ottawa Senators draft pick Shane Eiserman with perhaps a little more offensive upside. The Hockey News’ latest Prospect Watch of NCAA signings includes Bellows and 2015 recruit Liam Coughlin, a Catholic Memorial product who skated for the Vernon Vipers last season and was one of only five BCHL players selected in the NHL Entry Draft last month. Two former Terriers will play management roles for the U.S. U-17 Select team mentioned above. 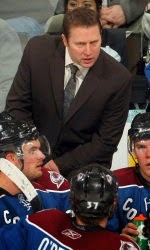 Ken Rausch, a member of the BU 1995 national championship team, will serve as general manager. Clark Donatelli, a late 80’s BU standout and two-time U.S. Olympian, will be an assistant coach. Former Terrier defenseman Adam Clendening was named to the AHL all-star team in his first two pro seasons, the first player to do so in more than a decade. Now he’s aiming for a spot on the Blackhawks roster. The Wheatfield, N.Y. native is in Chicago’s development camp, along with BU netminder Matt O’Connor. Former BU forward Matt Nieto, after a successful rookie season in San Jose, is expecting an increased role in 2014-15. The Terrier Hockey Alumni are holding their annual Players’ Golf Tournament on Monday, Aug. 11, at the Granite Links Country Club in Quincy, Mass. The fundraising event, which benefits the BU Hockey Program, is being organized by a trio of former Terrier defensemen: Pat Aufiero, Kevin Kielt and Tommy Ryan. The winner of last year’s fundraiser, which drew more than 60 participants, was the foursome of Keith Emery, Bobby Hanson, Greg Quebec and Kielt. BU officially announced the appointment of former Terrier, Olympic and NHL standout Scott Young as its new Director of Hockey Operations, succeeding Pertti Hansanen. Young returns to Commonwealth Avenue after 17 NHL seasons and four campaigns as head coach of his prep alma mater, St. Mark’s School. “What’s really going to help is that he’ll serve as a sounding board to the coaching staff. Besides running the day-to-day operations, he can help plan our practices and make suggestions to the coaches about what needs attention. During games, he’ll be behind the bench, helping to monitor what is happening on the ice from a systematic viewpoint—looking at both our team and the opposition. While Scott can’t directly coach the players, he can tell the coaches what he’s observed. He’ll also be involved in breaking down video to prepare for games." 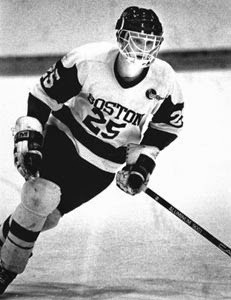 The right wing from Clinton, Mass., played for two seasons at BU, totaling 65 points and earning Hockey East Rookie of the Year honors in 1985-86. After a year with the U.S. National Team and his first of three appearances with Team USA in the Winter Olympics, he joined the Hartford Whalers who had selected him in the first round (11th overall) of the1986 NHL Entry Draft. He would go on to play on Stanley Cup champions in Pittsburgh (1991) and Colorado (1996). Young achieved career highs in goals (40) and points (73) in 2000-01 with St. Louis, the team with whom he would conclude his playing career in 2005-06, with 757 regular season points on his record. Young also was a member of the gold-medal winning U.S. team in the 1996 World Cup of Hockey (along with ex-Terriers Shawn McEachern, Tony Amonte and Keith Tkachuk) and is one of only 20 Americans to play in three World Junior Championships. St. Mark’s has announced that Young’s successor behind the bench is 2000-01 BU captain and former Boston Bruin Carl Corazzini. A fan favorite who scored 117 points in four seasons as a Terrier, “Captain Carl” had been coaching at Weston H.S. since ending his professional career in 2011. Along the way he had stops with the Providence Bruins, Atlantic City Boardwalk Bullies, and Germany’s Straubing Tigers. He scored his only two NHL goals with his hometown Bruins in 2004. ► BU has announced two changes to the 2014-15 schedule: The Terriers' home game against Hockey East newcomer Connecticut moves from Nov. 16 to Saturday, Nov. 8; and the venues for the home-and-home with Merrimack have been flipped. BU will visit MC’s Lawlor Rink on Dec. 5 and then host the Warriors on Dec. 6. 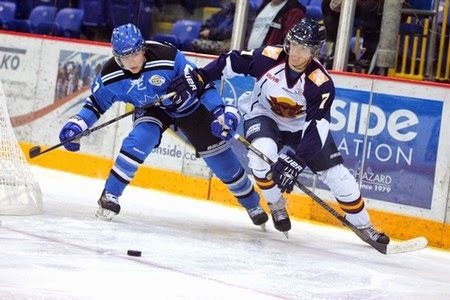 Boston.com began a series on Bruin development camp invitees with a profile of Terrier captain Matt Grzelcyk (left). Johnathan MacLeod, selected by the Lightning in the third round of the recent Entry Draft, participated in the team’s development camp in Tampa. 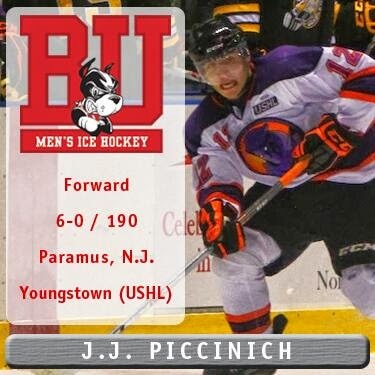 A pair of 2015 Terrier recruits and two incoming freshmen have been invited to attend NHL development camps. Maxim Letunov, a second round Blues’ pick in the draft, will participate in the St. Louis camp beginning today at the Ice Zone in the St. Louis Outlet Mall. Former Terrier Sam Kurker also was invited. THN’s Ryan Kennedy, reports that Bobo Carpenter has been asked to join the Toronto camp. Carpenter, who led Austin Prep to the Mass. High School Super 8 title game, will spend next season with the USHL Sioux City Musketeer. Also attending Toronto’s camp is 2014 recruit J.J. Piccinich, (right) the Leafs’ fourth round draft pick. CHN’s Mike McMahon tweeted that “BU freshman D Brandon Fortunato was invited to Detroit's camp, but he's spending his summer taking classes at BU prepping for the season.” Sophomore Robbie Baillargeon, who led the Terriers in scoring as a freshman, will attend his second Ottawa Senators camp. ►The full list of current, future and past Terriers invited to NHL development camps can be found in the College Hockey Inc. compilation of invited players with college hockey connections. NHL Central Scouting’s early look at the 2015 draft includes three BU recruits Jack Eichel, Jordan Greenway and AJ Greer. 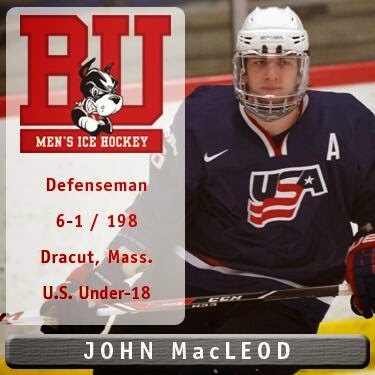 Former BU co-captain John McCarthy signed a one-year two-way contract with St. Louis. He had played 87 games for the Sharks, who drafted him in 2006. 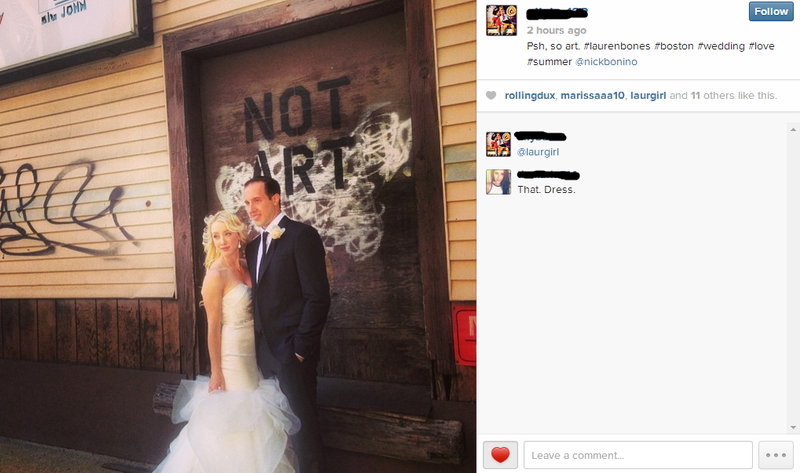 Former Terriers Nick Bonino and Lauren Cherewyk were married in Boston over the holiday weekend, with former BU captain Kevin Shattenkirk serving as best man. Bonino, a 117-point scorer in three BU seasons, including 50 points for the 2009 national championship team, recently was traded by Anaheim to Vancouver. 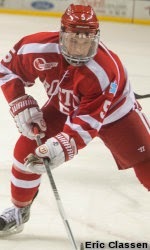 Cherewyk tallied 71 points in four varsity seasons; in 2009-10 she was the team’s second leading scorer, helping the Terriers earn their first Hockey East Championship and first-ever NCAA tournament berth.